Nailtiques is a unique therapeutic nail care system designed to promote and maintain healthy, natural nail growth. Everyone’s nails are different and need treating in a very individual way to ensure their condition is improved. Whether nails are soft and thin, hard and dehydrated or just require a maintenance programme, Nailtiques has the formula to suit everyone. The Nailtiques range has been formulated and designed to work together as a total manicure and pedicure regime. The products complement each other, all with an individual role to play in the whole procedure. 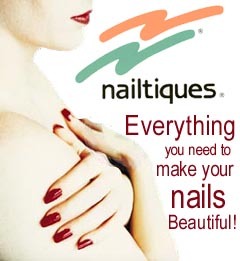 Nailtiques uses ingredients that work in synergy with the natural make up of the nail. Nailtiques contains a combination of natural proteins and conditioners to nourish the nail and the range’s moisturising treatments re-hydrate and recondition the nail, cuticle and surrounding skin. Nailtiques was founded in 1993 and has developed into a world renowned system that is synonymous with quality salons and professionalism; that’s why Essentials has included the use of Nailtiques products in all pedicures and manicures – so as to produce effective and exceptional results and create beautiful treatments every time. as standard and at no extra cost to you! expect a high performance regime at no extra cost to you! Nailtiques Nail Protein formulas were created to treat different nail conditions. The salon-tested formulations offer special combinations of ingredients, including hydrolyzed keratin and protein in combination with gelatin and calcium to build a healthy nail foundation. The protein formulas bond the nail layers together building a strong nail foundation to promote natural nail growth, strength and moisture retention and be resistant to peeling, chipping and splitting. Maintenance for Healthy, Flexible Nails. Formula 1 will help maintain a strong, yet flexible nail. This carefully balanced formula will continually work to bond the nail layers together while preventing the nail from becoming too hard. Formula 1 is recommended for nails that are naturally healthy or have been treated with Formula 2 or Formula 2 Plus® and have overcome previous problems.Healthy nails are not only strong, but flexible. To maintain healthy, flexible nails, apply Formula 1 three times per week. Formula 1 may be worn alone or as a base coat and topcoat with colour polish. Treatment for Soft, Peeling, Bitten, Weak or Thin Nails. Apply daily. As nails improve, decrease application. Formula 2 may be worn alone or with colour polish. Care for Naturally Hard Nails. Naturally hard, dry nails will become healthier when Formula 3 is used. This formula is a blended combination of protein and conditioners that will provide the proper balance needed to promote flexibility.The protein in this formula will bond the nail layers together, to help prevent splitting or breaking low at the stress points. The conditioners help promote flexibility within the nail. Nailtiques Nail Moisturiser is a must for initial treatment when this formula is prescribed, as it will help restore and maintain flexibility within the nail. Formula 3 may be worn alone or as a base coat and topcoat with colour polish. Treatment for Excessive, Problem Nails. Formula 2 Plus® is slightly stronger than Formula 2. This formula is an option for those who have used Formula 2 for at least 6 weeks without colour polish and desired results have not been achieved. It is designed to assist nails in overcoming stubborn problems allowing firm yet flexible nails. Apply daily. As nails respond, decrease application. Once nails have improved, return to Formula 2 until nails are healthy. Formula 2 Plus® may be worn alone or with colour polish.